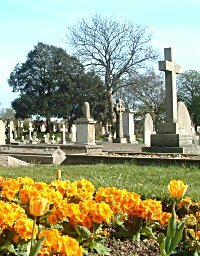 Highland Road Cemetery (sometimes referred to as Eastney Cemetery) is located adjacent to Highland Road in Southsea, Portsmouth. Apart from Highland Road itself the cemetery is bounded by Bristol Road, Festing Grove and Kimberley Road. The entrance is situated close to the end of Bristol Road. Highland Road Cemetery was opened in November 1854 at a time when it stood in open country, over a mile away from the rapidly expanding town of Southsea. Since then the town has completely engulfed the cemetery. There are 271 men and women whose graves are maintained by the Commonwealth War Graves Commission buried in the cemetery. We have listed them alphabetically according to the conflict in which they died. There are some who do not fit these categories and they have been listed separately. Each of the graves identified in Highland Road cemetery is allotted a grave reference number according to it's location. This consists of a section name or letter, a row number and a grave number. To determine the location of any grave check the reference number against the name in the alphabetical list, then place your cursor over the section name or letter on the cemetery plan, which appears on every page, for a detailed diagram of grave locations.